A favourite with the art and publishing world by day, and a funky bar and club by night, Paris’ Left-Bank institution in Saint-Germain-des-Prés, has just emerged from a makeover. 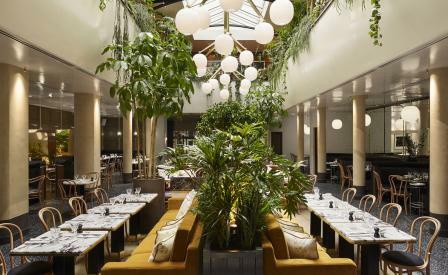 Originally dressed by Sir Terrence Conran, the restaurant’s fresh new look is down to director Michel Besmond who called on local designer Laura Gonzalez for a total transformation. ‘Laura is a very Parisian designer. She captured the eclectic, feel-good atmosphere of the place and transcribed it with her genius for mixing luxury materials with flea-market finds,’ says Besmond. Lush greenery and hanging plants from the mezzanine balcony, dominate the ground floor, where classic thonet chairs, marble table tops and mustard banquettes are bathed in swathes of light from the skylight above. Upstairs, parquet tabletops, woven stools and velvet armchairs are by Gonzalez, who extends the tropical vibe with her palette of khaki, ochre, fauve and bronze. Meanwhile, witty touches include alcove seats with phone chargers in the entryway, allowing diners to take calls discreetly during dinner. The menu - illustrated by Pierre Le-Tan - proposes an upbeat take on bistro classics such as roast cod with clams, cockles and oyster leaf; slow-roasted shoulder of lamb in apricots, almonds and spices, and an excellent selection suitable for vegetarians.